The bull market’s blow-off-like trajectory has steepened, if such a thing were imaginable, with Wednesday’s 322-point rally in the Dow. The blue chip average is ostensibly headed to the 27,251 target shown, and although this Hidden Pivot resistance is worth shorting, I wouldn’t recommending standing in the herd’s way if it is exceeded by more than 10-15 points. The broad averages reportedly are about to set a record for consecutive days of upwardliness without a correction of 5% or more. It sure feels like it. The opportunity for buyers to take a breather may be approaching with the nearness of the target flagged above, but we shouldn’t be shocked if it fails to contain their energy. 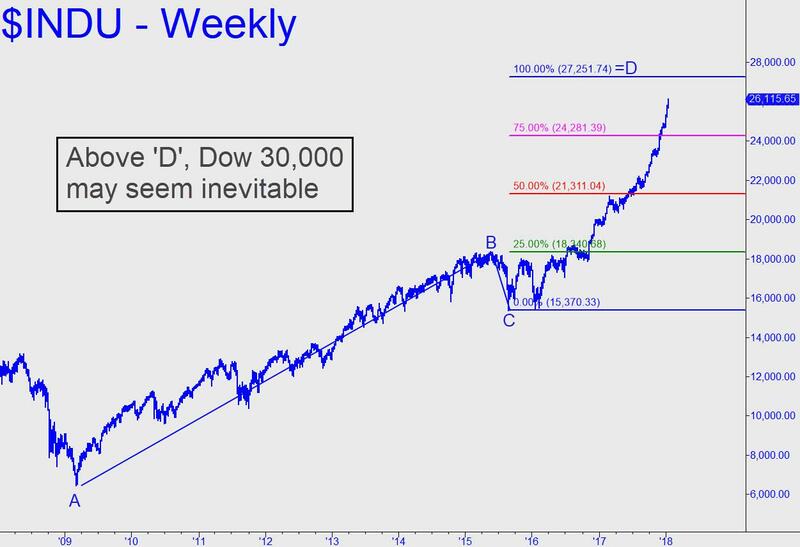 At that point, Dow 30,000 would become all but a foregone conclusion. However, we should keep in mind, even as the Indoos appear to steam toward their destiny with that enticingly round number, that ‘foregone conclusions’ are the stuff of bull traps.